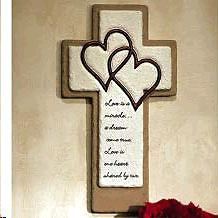 Celebrate those special loves -- of couples, families and friends with this stunning dimensional cross. It's crafted of resin with a stunning stone texture and comes ready to hang. Measures 5 1/2" x 10". Love is a miracle… a dream come true. Love is one heart shared by two.